I spent a portion of last week in Kentucky for the Oaks and Derby. We drove 8 hours to get home on Sunday and I jumped straight back into work the next day, so I’ve finally started going through the photos from my trip. Most of the Oaks and Derby pictures I took are on the disappointing side, since I was not allowed to bring my DSLR with me due to increased security measures. However, I’ve still got some fun ones to share! I’ll leave you with the charming Agent Di Nozzo for now. This handsome Ghostzapper gelding is in the Steve Margolis barn at Churchill Downs and happens to be stabled next to two horses that are part of my partnership. 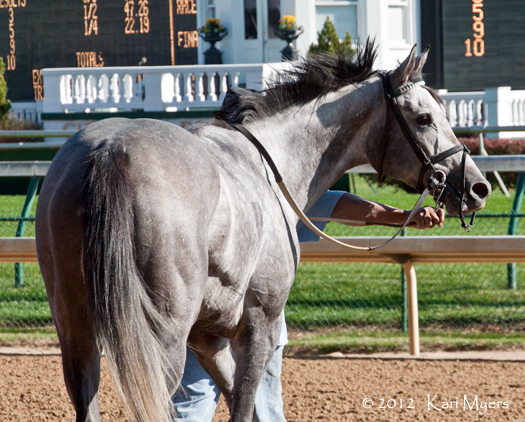 Nov 2, 2012: Sookie Stackhouse heads back to the barn after her claiming race at Churchill Downs. Handicapping races can be quite difficult, especially considering the enormous number of variables to mull over. 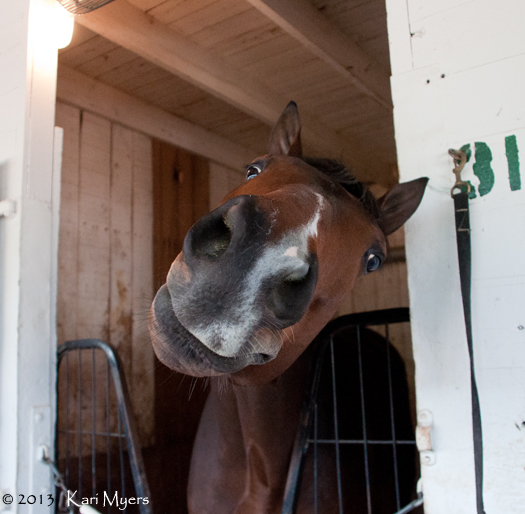 How has a horse been working in the mornings? How well did it do in its last race? Is there a lot of speed in the current race? Is there any speed? Is the track muddy, or is it fast? Is this the first time a horse is trying turf, or maybe synthetic? Putting all of that aside, sometimes it’s just fun to make hunch plays based on names. Are you an NCIS fan? How about $2 to win on Agent Di Nozzo? Can’t get enough of True Blood? Go place a wager on Sookie Stackhouse. If you like playing tennis, maybe Doubles Partner is the one for you. Eminem fans might want to run to the windows and put a little money on Slim Shadey. My fellow Star Wars geeks out there might like to take a look at the 7th race at Churchill Downs on June 11, 2010. That day was the 30th anniversary of the release of The Empire Strikes Back, and the 7th race featured an Empire Maker gelding by the name of Jedi Code. He certainly wasn’t the logical choice to win, since the only other win of his career had come almost three years prior. But enough people played the Star Wars hunch that he was bet down to even odds and ended up going off as the betting favorite. You guessed it, Jedi Code won by almost four lengths. The Force was with him! Nov 2, 2012: Sookie Stackhouse again because she’s just so cute. 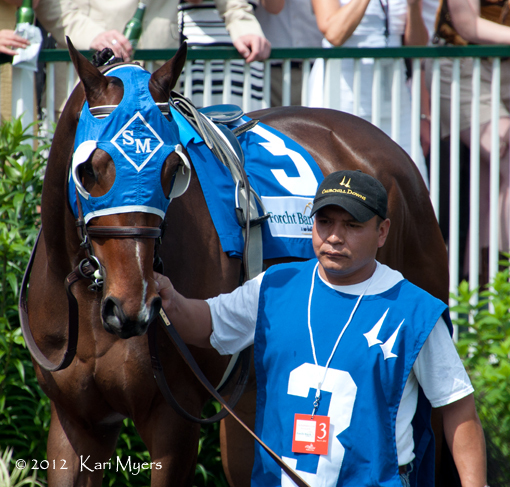 May 5, 2012: The handsome Agent Di Nozzo in the Churchill Downs paddock before his solid 3rd in an allowance race behind stakes winners Skyring and Golden Ticket. 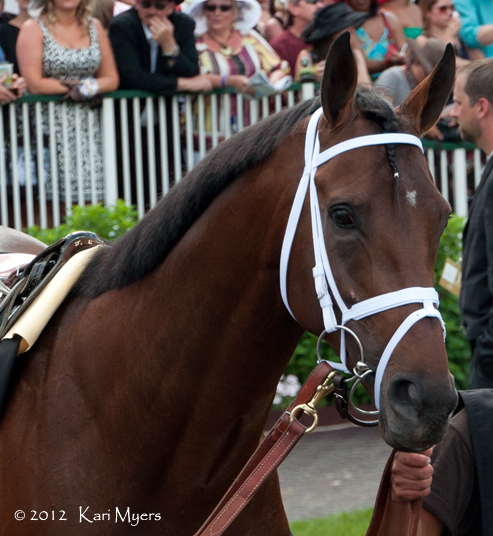 May 5, 2012: Doubles Partner in the Churchill Downs paddock before his 4th place finish in the Grade 1 Woodford Reserve Turf Classic. 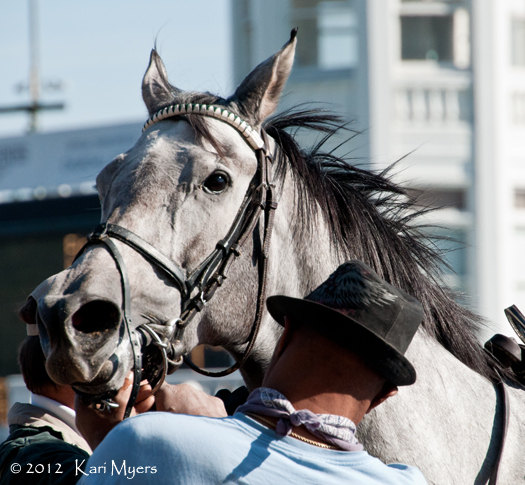 May 5, 2012: Slim Shadey being a butthead in the Churchill Downs paddock before his 2nd place finish in the Grade 1 Woodford Reserve Turf Classic behind Little Mike. 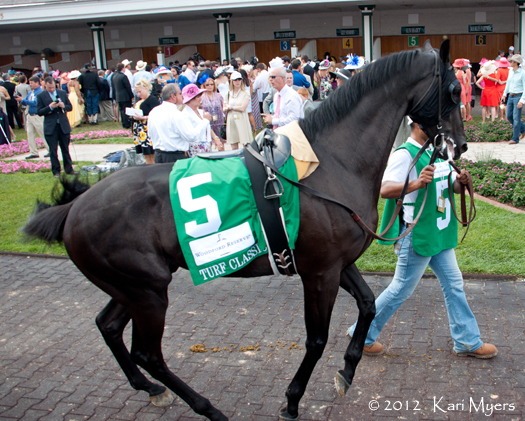 Slim Shadey was such a handful that it took several people to saddle him while he walked in circles around the paddock.